Siddharth Chatterjee is the United Nations Resident Coordinator and the UNDP Resident Representative in Kenya. Food security in Kenya has deteriorated significantly since the end of 2016. UNICEF reports a significant increase in severe acute malnutrition. Nearly 110,000 children under-five need treatment, up from 75,300 in August 2016. Waterholes and rivers have dried up, leading to widespread crop failure and livestock depletion. At the height of the drought, surface water in most counties had either dried up or its level dramatically reduced. Consequently, within a year, the price of maize flour has risen by 31 per cent, milk by 12 and sugar by 21 per cent. These food price increases have driven inflation up from 9.04 per cent in February to 11.48 per cent in April. Many families are making do with just one meal in a day. Conditions are dire in half of Kenya’s 47 counties. Livestock and milk production has declined, adversely affecting food consumption levels for communities, particularly women and children. Malnutrition is widespread among children. 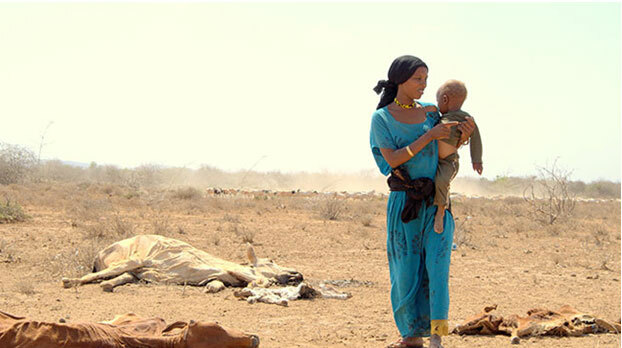 In the hardest-hit counties of Turkana, Marsabit and Mandera, a third of children under 5 are acutely malnourished – double the emergency threshold. High malnutrition, when combined with an outbreak of cholera or measles, can lead to a surge in deaths among children and other vulnerable groups. 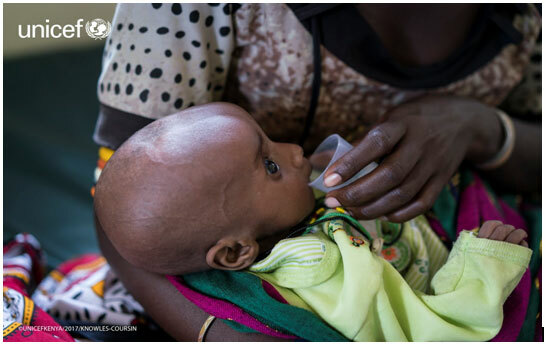 We must urgently respond to this malnutrition crisis through treatment and prevention. Blanket supplementary feeding for young children and pregnant and lactating women can avert a catastrophic spike in mortality in the months ahead. The World Food Programme (WFP) and partners have developed a US$30 million plan to intervene with blanket supplementary feeding in nine northern hotspots, but only 10 per cent of the required funds have been committed. By the time the Government had declared drought a national disaster, over 2.6 million Kenyans were in urgent need of food aid. This figure will increase unless an appeal for US$166 million to support the most vulnerable is met; less than a third of that amount is available so far. Don’t be fooled by the news of floods in recent weeks, this has done nothing to alleviate drought-induced malnutrition among children. Flooding is an indicator of poor infiltration resulting from lack of vegetation and soil degradation. This means that much water is flowing off the soil and too little is seeping in. We will face drought again before the onset of the short rains later this year. President Uhuru Kenyatta declared a national drought disaster in February 2017 and committed US$128 million towards the national drought response. The Government of Kenya has allocated resources for food aid and monthly cash transfers through its Hunger Safety Net Programme. Its Livestock Insurance Programme offers a lifeline to affected pastoralists, enabling them to purchase animal feed to keep their herd alive during drought. In addition, offtake programmes are helping farmers to sell of their herds and restock as necessary when conditions improve. These are commendable efforts but the number of people accessing such support is not enough, and the needs are fast outpacing the response. Climate scientists predict that weather patterns will continue to change. This will bring about more frequent, intense and widespread droughts and flash floods. The vast majority of smallholders in sub-Saharan Africa are dependent on rain-fed agriculture for their livelihoods and are subject to the vagaries of the weather. We need long-term solutions to alleviate the adverse impacts of climate change and unpredictable weather patterns. We must build the resilience of communities and invest in agriculture and rural infrastructure. This includes turning away from dependency on rain-fed agriculture towards large-scale water harvesting and innovative irrigation systems. Due to traditional farming practices, crop yields on the continent have about one-tenth the average productivity of Western farms. Sub-Saharan Africa is the only region where per capita food production is sadly falling. Areas in Somalia and coastal Kenya affected by the current drought have registered crop failure of 70 to 100 percent. In richer countries, drought-resistant crop varieties have been developed to cope with water scarcity and other climate-induced shocks, including varieties of maize, cowpea and sorghum. A major hindrance to their adoption in East Africa is the weak legislative framework for registration and the lack of appropriate technologies. Soil moisture management is becoming an increasingly important aspect of crop production. In partnership with the EU, WFP, IFAD and the Government of Kenya, the Food and Agriculture Organization (FAO) has a developed programme to promote conservation agriculture, but this approach must be scaled up. 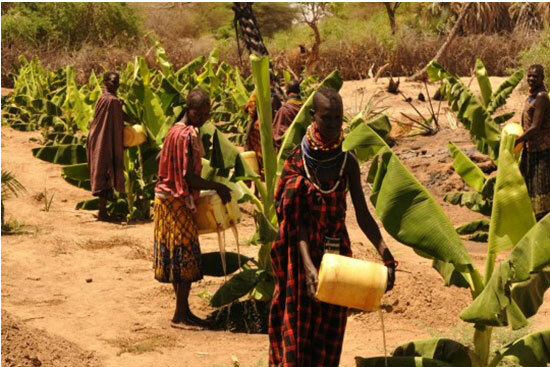 UNDP has created capacities for food production in Turkana County, slowly building community resilience and food security through irrigation. This has the potential to reduce dependence on rain fed agriculture and create practical models for scaling up through the northern frontier development council in Marsabit, Mandera, Wajir, Lamu, Tana river, Garissa and Isiolo Counties. With advances in mobile technology, smallholders now have better tools to forecast impending crises. The Kenyan Government should work closely with communities to build resilience and put in place mitigation measures before the onset of large-scale crises. County governments, created mainly to bring services closer to citizens, are particularly suited to mapping out priorities and matching them with viable solutions. For example a county like Turkana has the potential of not only being the breadbasket of Kenya, but a source for fresh water for all of Kenya for the next 70 years. The international community can contribute to these efforts by\supporting and partnering with policymakers, researchers and local communities on the effective uses of forecasting and early warning early response mechanisms. Piecemeal responses to climate-related emergencies can no longer suffice. We need sustainable solutions to effectively tackle drought and its devastating impacts on Kenya’s most vulnerable communities, particularly women and children. Have check dams, gabions and swales been used? They are simple low tech ways of capturing and utilizing the rain that falls as opposed to letting it run off, cause erosion and evaporate.